The night before Halloween I was getting the final preparations down for Lucky's Halloween Birthday Party when I realized that I needed to finish MY costume! I wanted to be a pumpkin patch and wear my pumpkin maternity shirt. What I needed was a fun hat to bring my costume some whimsy. 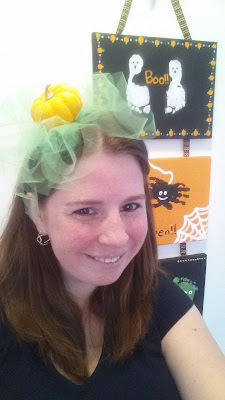 I set out to make a mini pumpkin fascinator headband with some tulle, a headband and a glue gun. I started by cutting my "vines" (lime green tulle) into one inch strips. I only purchased maybe a quarter yard of fabric for this project. Each strip was 14" long, approximately a quarter of the width of the fabric. I tied the tulle tight onto the headband in one spot, letting the ends go out in every direction. Seriously, I just double knotted the fabric strips overlapping my knots. Now it was time for the hard part... can I get a real miniature pumpkin to stay on top of the headband using hot glue? The answer is yes! I had to let the glue sink through the tulle a bit before settling the pumpkin on but it worked! I used my knitting machine to help keep the headband upright until the glue cooled, but it wouldn't have been hard to just hold onto this for a few minutes. Voila! A fun costume created in minutes. Here we are about to start our Halloween celebrations. 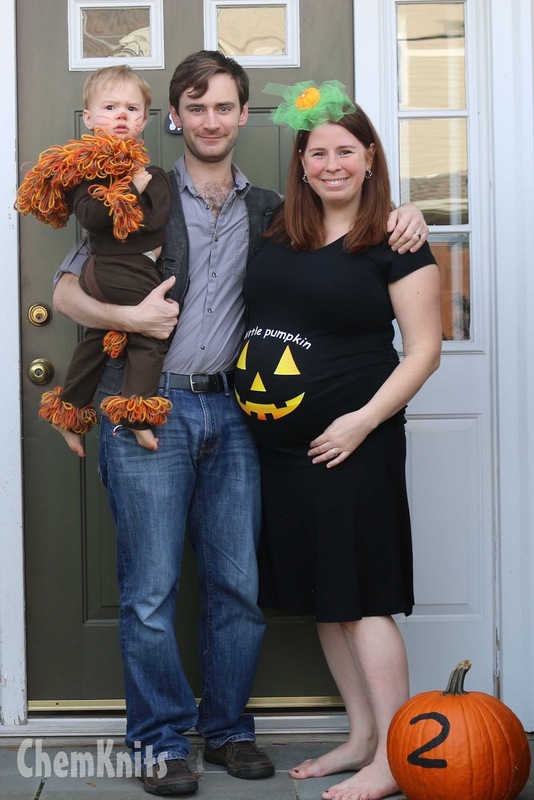 A growing pumpkin patch, a lion, and Owen from Jurassic World. I'm almost done talking about all of the diy projects I completed for this party, and soon you'll get to see how it all came together!